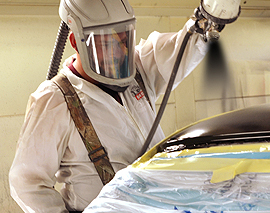 In our repair process, all of the damaged parts are taken off of your car. The estimate tells the technician what parts are being replaced or repaired. Sometimes when the estimate is written there is additional damage that the adjuster can not see. During the disassemble process we are able to create a supplement. This notifies the insurance company to let them know that we will have your car longer and need additional parts on the estimate replaced. Someone will contact you to let you know if this happens. Delays will occur with your vehicle but, we only fix it right. Delays may also occur when your vehicle gets towed to our repair facility. We can only order parts if the insurance company gives us the ok. As soon as we are notified when your parts will be received we will then schedule your vehicle for repairs. The only way to do a collision repair right is to disassemble the body and inspect what parts need service or replacement. Our skilled technicians know what to look for to guarantee your safety. Upon the disassemble and analysis of repair or replacement, we will order part based on your needs. As parts are delivered, we will exhibited your repair as fast as possible. Cost may be reassessed at this point. We adhere to PPG's standards with an Envirobase system. This is a water base product that reduces drying time but delivers a long lasting finish. We only use the highest of quality finishes. 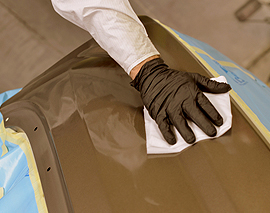 Once the repair process is complete, we start refinishing by using a dry sanding technique to produce a smooth surface for the paint to be applied. 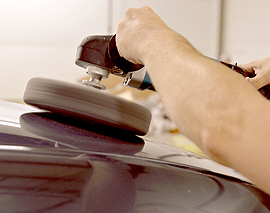 We then use a liquid solvent to remove any extraneous grit or debris to ensure a smooth paint finish. This is done in a ventilated area to reduce vapors. We use a waterbase paint that is EPA friendly and has a fast drying time. This environmentally conscious solution guarantees a life long finish. We finish the process with a buffing and polishing process to ensure a nice protective coating over the fresh paint to give that like new finish. GW Auto Collision Repair © .